This event will feature International recording artist Chelsea Stewart and Saxophonist Isax Ins Jah from Canada. The show will also feature Veteran Reggae artists Tinga Stewart who has a new hit single with Fantom Mojah promoting and Reggie Steppa know for his monster hits Little Miss and Modeling and Anju Kat out of the Sly & Robbie Gang. The Dub poets will be representing through Ras Takura organizer of Disword wordz & Agro Fest, Sage, Mojiba Ase and two other Grantspen Dub Poets Akuna Matata and Ras Shaddi. 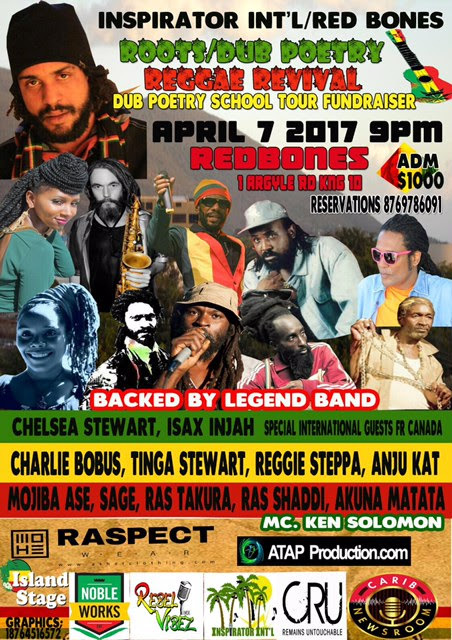 This event forms is a fundraiser for the Jamaica Schools Roots Dub Poetry Reggae Revival Tour in which various Dub poets and musicians will present the art form throughout schools across the country.